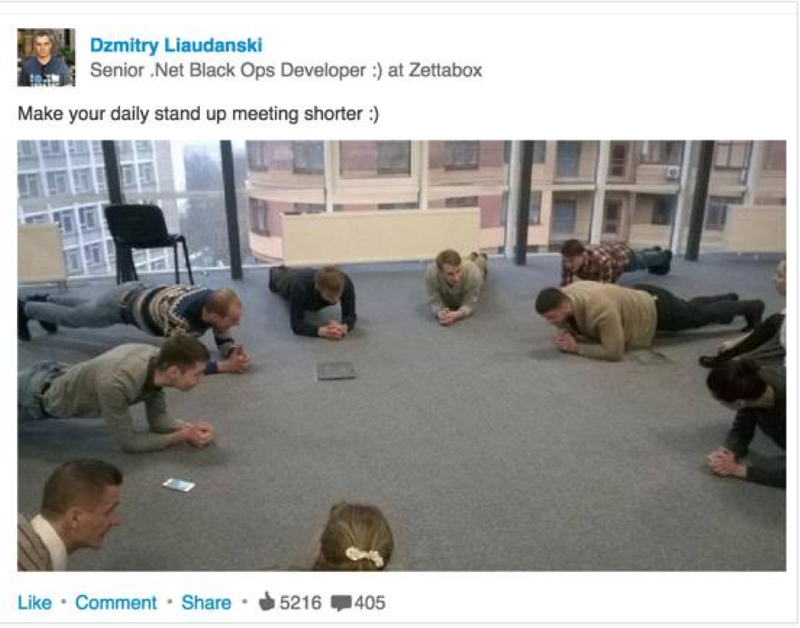 In software companies, daily scrum meeting has been a well known efficient way of getting the whole team on the same page. Although many implemented the meeting as a stand up meeting in the hope of keeping it short, teams sometimes still feel it too long because some people just talk too much! A better way is to use more intense activities to tax the talker by introducing more intense activity (only do this if your team is not keeping it short and you really want to give the people who break the rule a gentle nudge). 1. rest on the ground when you are not speaking. 2. must keep plank position if you are talking. 3. take turns to update on what you did, what you plan to do and what you are blocked on. Enjoy a nice work out. Stronger core muscles will help with back pain. After all, the healthier team == better team.